The Knights football team got to make the dreams of a young boy come true. Toby loves football and has many athletes that he looks up to. He had a wish to be able to spend time with the Knight’s football team before an upcoming surgery he had. Toby was born in China, where he lived in an orphanage. Toby was born with Neurogenic Bladder, Spina Bifida, and Club Foot. His family adopted him at the age of six. Toby was in need of surgery due to complications with his Spina Bifida. 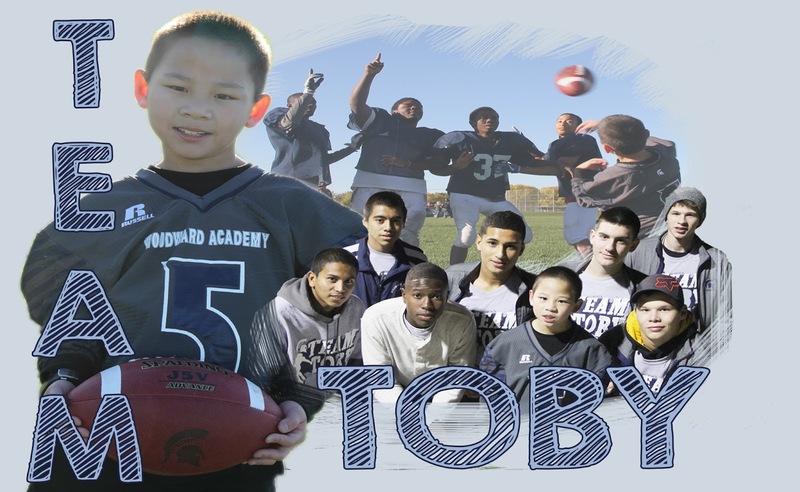 To cheer up Toby and show support the Woodward Academy football team invited him to join them at their practices and one of their games before his surgery. He got to meet the whole team and play catch with them. Toby got to attend their game against Des Moines Christian and watch from the sidelines. Our student section as well as staff and coaches wore shirts to show support for Toby and his upcoming surgery. The shirts had “Team Toby” printed on them. Toby had an amazing night cheering on the football players and meeting some of the other students. His surgery was a success and he spent time at home recovering. Toby definitely is now a part of the Woodward Academy Family and we are now part of Team Toby. GO KNIGHTS!